Baltimore's newest class of heroes took their last steps as recruits into the lives as officers. BALTIMORE. 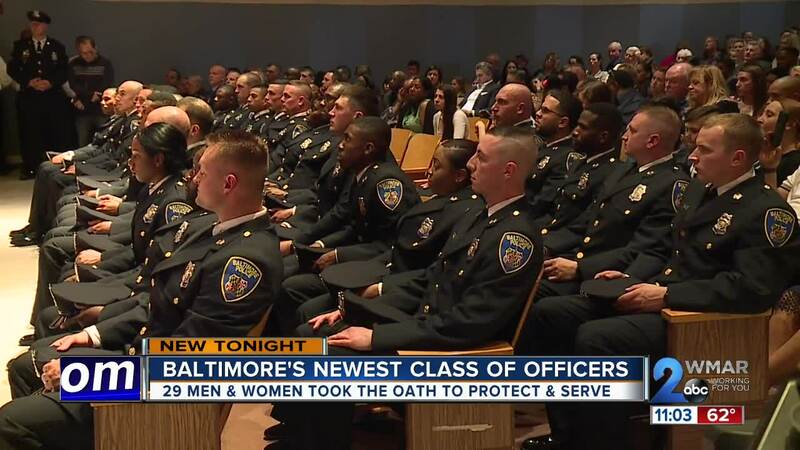 MD ( WMAR) — Baltimore's newest class of heroes took their last steps as recruits into the lives as officers. Officer. Jahlik Mathis is one of those new officers. “I think I can be one of those people that can help change Baltimore City.” said Mathis. Mathis earned his badge because he likes helping people. Something this city and department needs a lot of. There are over 200 vacancies in the country's eighth largest department. "I remember hearing about the Freddie Gray situation and saying i wish I was a part of the department to be able to help. I grew up in not the best city or not the best neighborhoods myself. I know what it’s like I know how the people feel. I know how the children feel to be able to grow up and feel like you don’t have many choices.” said Mathis. This class is graduating at a time where the need for new officers is high. It has been a violent week sandwiched in between the country's leading homicide rates and chapters of corruption in the Police Department. For commissioner Michael Harrison 's first class, his message to them was one of focus, repairing broken relationships and building new ones. “I said look to your left look to your right. Which one of you would be the police commissioner. Which one of you could possibly be the Mayor? That’s the level of positivity to have. I charged them all 29 to make sure that all 29 graduate" said Harrison. The officers are proud to earn their uniform today and are ready to honor the badge tomorrow.